As you’ve no doubt heard by now, it’s not just plants and animals that are becoming extinct at alarming rates. The world’s languages and cultures are disappearing too, and the pace is even worse: 11% of birds and 18% of mammals are predicted to die out by the end of the century, but a conservative estimate places language extinction at 40% (that’s about 2,800 of the world’s languages). The situation is just as grim for other expressions of culture — songs, stories, performance traditions — particularly those of Indigenous and minority peoples. International recognition of this new global crisis led UNESCO, in 2003, to proclaim a need for “urgent safeguarding” of the world’s intangible cultural heritage, including music. For those of us not directly affected by this massive cultural extinction, though, it’s easy to be complacent. Take music. For one thing, it can be difficult to imagine how it feels to have the music of our community disappear, especially if we grew up identifying most closely with the Rolling Stones (or Bing Crosby, or the Spice Girls). For another, it’s hard to think of any dire consequences when an obscure (to us) set of Maori fishing songs or Tibetan goat-herding songs are forgotten. So what exactly is lost when a musical tradition dies out? Why should we all care about this global crisis? Take ca trù, a complex and sophisticated chamber music tradition of north Vietnam, refined over many centuries, but so badly affected by recent decades of war and adverse government policy that in 2009, UNESCO ear-marked it as needing urgent support for its survival. Like all music genres, ca trù expresses what it is to be human. It offers a direct glimpse at the creativity of the human mind, and represents a continuum of intellect and imagination through the generations. As such, its loss, like that of potentially thousands of other threatened genres across the world, would be a loss to the common heritage of humanity. Another reason we should care about the loss of these traditions is that music, in all its forms, contributes to the rich diversity of humankind, and of our planet. Contemporary music genres are almost always nourished by older traditions, which form a point of departure for invention and transformation. And current genres will inform future ones too. This is what UNESCO refers to when it says cultural diversity “widens the range of options open to everyone”. That includes you, me, and Björk (who has drawn in her songs on the music of Syria, Japan, Iran, Bali, and her native Iceland, among various other sources). Just as smoke and fire go hand-in-hand, music is very often intimately linked with other intangible expressions of culture within a community. The loss of musical heritage may therefore mean the loss of the unique story that it carries, or the loss of an associated dance or ceremony. 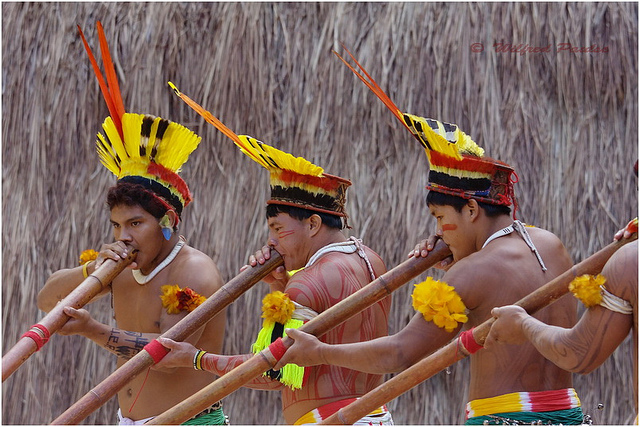 Kuriko Indians (Brazil) play Taquara Flutes. Dance, music, and ceremony are often interlinked in Indigenous cultures. © Wilfred Paulse. CC BY-NC-ND 2.0 via Wilfred Paulse / Flickr. Particularly for indigenous people and communities, songs can also be unique vehicles for transmitting local culture and history. They encode knowledge of genealogies and mythologies, records of ancestors and clan names, knowledge of the universe and the land, medicinal and culinary knowledge, social norms, taboos, and histories, and cultural skills and practices, among other things. When these songs disappear, much more than the songs themselves is lost. The loss of such knowledge is not only a loss for the communities concerned, but for the rest of us too. One music researcher has even convincingly argued that since songs represent ways of being in the world, their extinctions could “potentially compromise our ability to adapt to as yet unforeseen changes”. Traditional fishing or food-gathering songs may contain traditional ecological knowledge that could help us deal with contemporary issues challenging the future of the planet, including our own species. Vanishing musical heritage therefore holds consequences for the whole of humanity. Smot teacher Keot Ran chants smot on temple grounds in Kampong Speu province, Cambodia. Photo by Catherine Grant, February 2013. Used with permission. These are not the only reasons to keep music genres strong. Various other arguments invoke tourism, community capacity building, social cohesion, economic growth, positive health and well-being outcomes, and music’s remarkable ability to promote cross-cultural understanding, exchange, co-operation, reconciliation, and peace (this study carried out for UNESCO introduces many of these ideas). What is clear is that consequences of disappearing musics extend well beyond those individuals and communities directly affected. Music is one of the key links that ties us to one another — within and across communities, to the past, the present, and the future. We are just beginning to realise the possible repercussions of music endangerment across the globe. The challenge now is for us to care enough about what lies outside our own worlds, so that together we may make efforts to recover what is nearly lost. Catherine Grant is Joy Ingall Postdoctoral Researcher at the School of Creative Arts, University of Newcastle (Australia). Her book, Music Endangerment: How Language Maintenance Can Help, explores ways to keep endangered music genres strong.